The team is in France today for our first Champions League game of the season. 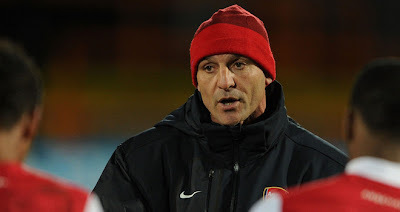 Steve Bould will be taking charge in the absence of Wenger who will be starting a three match touchline ban for being naughty. Bould will be in charge on the sidelines and is not allowed to communicate with Wenger for the duration of the match according to Uefa rules and I really do wonder if these rules are not circumvented considering the amount of technologies available to us today for covert communications. Whatever the case may be, Bouldie will have to take responsibility for whatever the outcome of today's game is. I have no doubt that Wenger has chosen the squad for today's game, and discussed all kinds of scenarios to determine substitutions et al during the game but Bouldie is the man for today -and the next two Champions league games for that matter. One thing we can be certain of is that some degree of squad rotation will be seen in the line-up today as an attempt will be made to keep the squad fresh and in shape for the various campaigns ahead. Arshavin and Djourou didn't make the 18-man squad that left for France on Monday morning. When you look at the list, it's difficult to see who they'd have replaced. "You cannot change a goalkeeper every time he makes a simple mistake, because then you have three bad keepers..."
So Mannone is back in goal and his clean sheets so far this season should give him enough confidence going into this tie though he'll have that blooper in the loss at Olympiakos last December at the back of his mind when he came on for the injured Szezesny in the 25th minute. It was his last appearance in Europe and I do hope the nightmare time he had on the day don't haunt his sleep any more. He'll be backed up by young James Shea who probably still can't believe how he jumped from fifth keeper to second. "He (Shea) was on the list as goalkeeper number five at the beginning of the season and now he is number two. That shows you how quickly football can change," Said Wenger. This time last year, it would have been panic stations at the prospect of these two in goal for us but the confidence level is high in view of our recent displays so we go to Europe with little fear. I'd back Walcott and Santos to start today's game in the spirit of rotation which will mean both Gibbs and Ox will start from the bench. Both should be good to go and are worthy replacements if Santos can keep his focus for 90 minutes. Walcott was jeered by a section of the Emirates at the weekend and Wenger confirmed afterwards that he was worried about his contract situation. Let's hope he's in the right frame of mind to start the game -this is the one reason I can imagine will keep him from the starting eleven. Vermaleen is likely to start, both because he's the captain and fancies himself as a superman of sorts. His partnership with Mert at center back has been very successful this season and has kept fit-again last season's first choice, Kos on the bench so far. The center back is a position managers are not quick to meddle with if both first choice are fit so my guess is that Kos will start on the bench once again. Diaby is back in the squad after missing the match at the weekend. If he's a 100%, I'd expect him to start the game as we'll be looking to put the match to bed as early as possible. Either Ramsey or Coquelin will be on hand as back up but something tells me Ramsey will be preferred ahead of Coquelin this time, considering the magnificent shift he put in when he came off the bench on Saturday. If anyone deserves to be rested in view of injury history, I guess it's Arteta. We'll be needing him at full throttle for the game against City on Saturday but my guess is that he won't be getting that chance so long as he's fit and of course Champions League football is one reason he joined us last summer. His compatriot, Cazorla as well deserves to be rested but I don't see that happening. Both have been integral to the effectiveness of our midfield play this season but Cazorla played every single league game for Malaga last season so his reputation as a work-horse will likely keep him in the side for as long as he's fit to play. Giroud is in the squad to play against his old team but given Gerv's display as a center-forward last weekend, I suspect he'll start in that position again today. Anyway, Wenger has said he didn't start him at the weekend to reduce the pressure on him because of his lack of goals so far and that situation has not changed. My predicted first 11 will be Mannone, Jenkinson, Per, Vermaleen, Santos, Arteta, Diaby, Cazorla, Walcott, Podolski and Gervinho. Haven't said much about our opponents so far. Montpellier is the French champions but they are not riding high at the moment in the domestic league. They went down to Rennes 3-1 last weekend to suffer their third defeat in the five games played so far in contrast to our unbeaten run this season. It is their first ever Champions League game and they will fight to impress the 30,00 fans that will be crammed into the Stade de la Mosson. My compatriot John Utaka will be lining out against us tonight but won't be wishing him luck tonight. Statistics wise, we have never lost an away game in France, winning five and drawing four but like I always say, statistics will change sometime. It is a game that on paper, we should win but Europe has been known to throw up wild cards each year and Montpellier will be looking to draw on that, to show that their league run last year was no fluke even if they appear to be struggling domestically. With the same attitude we've displayed in every department of the team this season, we should be back in London with the three points in a tote bag by this time tomorrow. Will be in touch with y'all via twitter for the duration of the game. Montpellier away tonight at 7.45pm. Let's go Gooners!